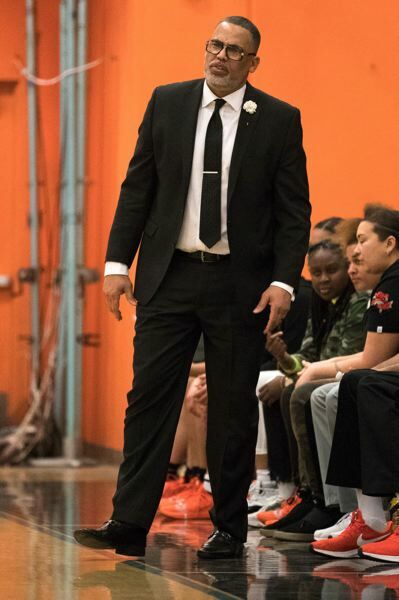 The way Eric Knox sees it, the seniors who will lead his Benson High girls basketball team through one more postseason run already are champions. "They're all going to college. That's the state championship," Knox says, rating academic opportunity above the basketball prize his Techsters will begin to chase with a first-round playoff game on Wednesday. "Everything after that is icing on the cake." 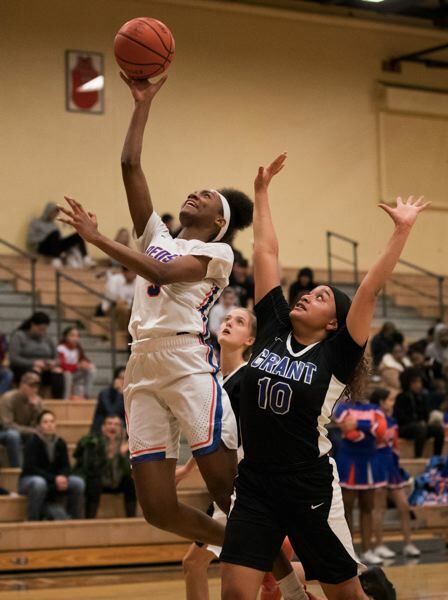 Having already won the program's first outright Portland Interscholastic League championship in more than two decades by going 16-0 in league play, the Techsters (21-4) are now focused on topping off their season with the program's first state title. "We all have the same dream, the same goal: To get to the Chiles Center and play hard and finish and win a state championship," senior point guard Makenzy Porter says. "We all have one goal, and we all act as a family to do that." Unlike last season, when seventh-seeded Benson's run to the Class 6A championship game was a surprise to many, these Techsters enter the postseason as the No. 3 seed in the Oregon School Activities Association field. They are led by a group of seniors who began dreaming about putting Benson on the basketball map while still in middle school. 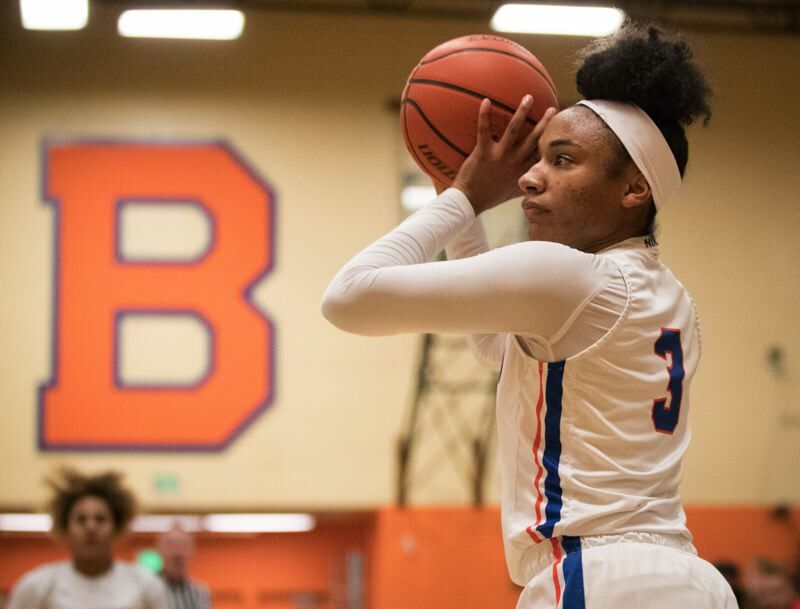 Ciera Ellington, a 6-0 guard-wing who is committed to Loyola Marymount, has been an impact player since arriving at Benson. After fighting through an injury last season, Ellington leads the Techsters with 19.2 points per game. She also contributes five rebounds, 4.7 assists and 3.3 steals per contest. Whenever she is done with basketball, she wants to go into nursing. Tayler Lyday, a 6-1 wing who was a unanimous first-team state tournament selection as a junior, is averaging 17.1 points, 6.2 rebounds. 2.4 steals and 2.0 blocked shots per game. Lyday plans a few more recruiting trips before choosing a college. Beyond basketball, she is interested in aerospace engineering. Knox says Harris has improved more than any of her teammates since middle school and is "one of the most committed kids I know." Porter, the Techsters' 5-4 motor who chose basketball over softball in part to prove her lack of height was not an obstacle to success, averages eight points, 4.1 assists and three steals a game. She joined Lyday on the all-tournament first team at state last season. Porter intends to play college basketball and will likely walk on somewhere. Aujae Yoakum — a versatile 6-1 junior who played on those middle-school teams for Knox with Ellington and Porter — averages 12.4 points, four rebounds and two assists. An athletic wing who Knox describes as a cross between Ellington and Lyday, Yoakum was part of last season's run to the state finals. The playoff success in 2018, plus this season's tough nonleague competition, means these Techsters shouldn't be fazed by playoff pressure. Knox recently reminded his team that: "You guys have prepared for these moments so the pressure shouldn't be there because you know what to do. Let's go out and make some noise now." The Techsters' first-round game is at home against Lakeridge at 6:30 p.m. Wednesday. Only No. 1 Southridge, the team that handled Benson 46-27 in the 2018 state championship game, and Tigard are seeded higher. Benson beat Tigard 52-44 on Dec. 27. The Techsters and Skyhawks tangled on Dec. 29, with Southridge prevailing 55-50. "I just feel like they out-executed us," point guard Porter says. "I feel that as long as we play our game and do what we're supposed to do nobody can stop us. "It's not about who we play. It's about how hard we're willing to work as a team." 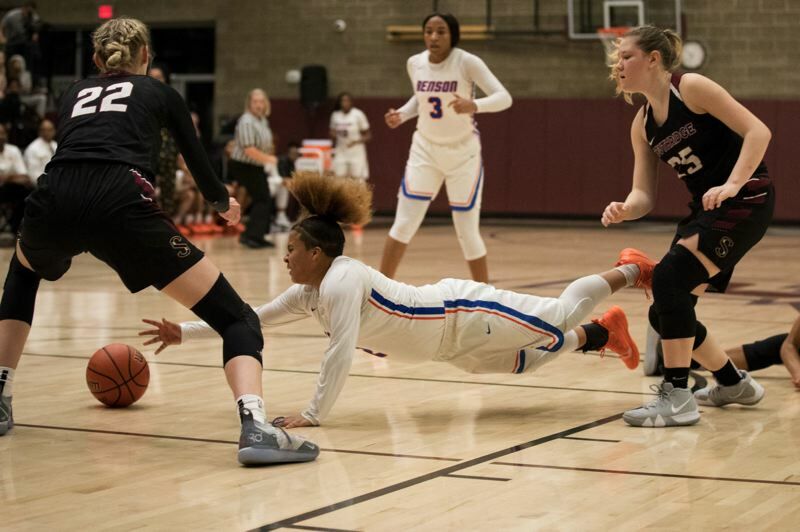 The loss to Southridge was the fourth in a challenging 11-day stretch in which the Techsters went 1-3 against elite competition at a tournament in Phoenix, then finished 2-1 in the PIL Holiday Showcase. One of the improvements from that stretch of games was better ball movement and less unnecessary dribbling, according to Lyday. The challenging nonleague games, along with last year's postseason success, provided the kind of tough experience Knox hopes will pay off over the next couple of weeks. "We just feel like we're prepared for this moment," Knox says. 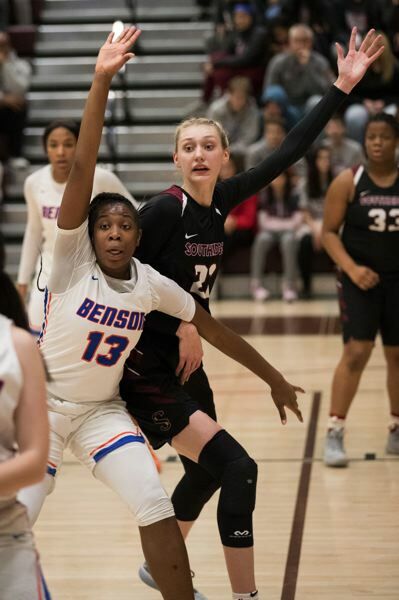 Benson is better than it was a year ago because each of its significant players is a year older, because Ellington is healthier, and because all-PIL guard Bria Dixson transferred from Franklin this year as a junior. Ellington played her entire junior season with a sore hamstring that was at its worst during the state tournament. It did not completely heal until this fall. Ellington felt she let down her teammates at the 2018 tournament because she didn't score at her usual rate — but learned that she didn't need to focus only on scoring. "I realized that (Knox) was still keeping me on the floor, and even if I'm not scoring, just by being out there I can impact the game in other ways," she says. Add in the shooting ability and basketball savvy of Dixson and the Techsters are strong across the board. The 5-8 Dixson, who averages 15.2 points and 4.1 assists, played with many of her Benson teammates on a middle-school club team coached by Knox. The arrival of Dixson added a perimeter scoring dimension Benson lacked a year ago. "She changed the dynamic of our team." Knox says. "She can shoot that ball, and it opens up the floor for Ciera and Tayler and Aujae." While their athleticism jumps out, the Techsters say their ability to respond to different challenges is one reason they enter this postseason with confidence. "They know how to play a lot of different ways," Knox says. "So teams that try to slow Benson down, it's not going to rattle us. Our kids know how to be patient and play methodical and smash-mouth if you want to play that way." Ultimately, the Techsters believe their fate is in their own hands — that if they are smart and tenacious they can meet any challenge. "Nobody can beat us but us," Porter says. "I feel like the losses we've had have been mental and physical losses on us, not really the other team being able to out-execute us." No matter how the journey ends, Knox — a passionate advocate for Portland's diverse community — says this group has made a lasting impact. "There's always an extra layer when you have a predominantly black team. There are community expectations," he says. "These girls have been living with expectations for about four years now." The players have embraced the hopes of their classmates and neighbors. "Everywhere I go, they either know Coach Knox or they know our team or they know both." Porter says. "For the program, it just shows that people that look like us — black and brown girls from this community — that they do something that they want to do and excel at it." None of the Techsters has been followed by higher expectations than Ellington. Tested by last season's injury, she says improved self-esteem is a key ingredient to her senior season. "Being mentally tough in games when stuff is going wrong? I think I'm just now starting to get good at that," Ellington says. "Before, I would shut down if I'm having a bad game. Now that I'm a senior and more mature, it doesn't really affect me." If Benson wins its first-round game Wednesday, it would move into the 16-team second round, which is set for Saturday, and play at home again. Win that game, and the Techsters would return to Chiles Center for the 6A tournament. The quarterfinals are March 7, with semifinals on March 8 and the championship game booked for 8:30 p.m. Saturday, March 9. 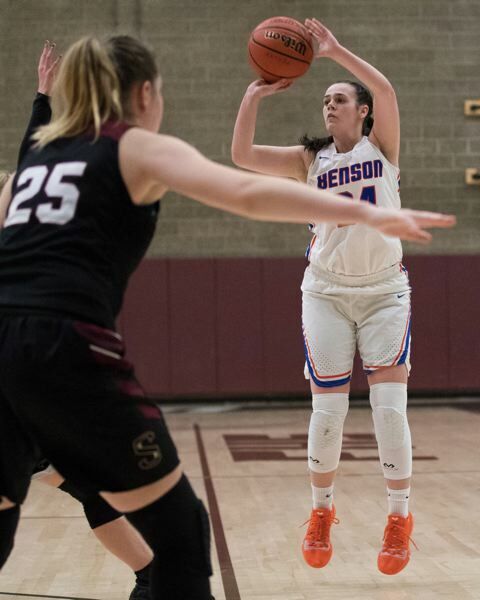 With the end of her high school basketball experience fast approaching, Ellington says she is thankful for the real opportunity to pursue the championship that has been a target since middle school — and to experience the chase with some friends she's played alongside since fourth or fifth grade. "My mind is blown. From where we started to where we are now," Ellington says. "I'm just so happy to be on this team and to be with these girls."